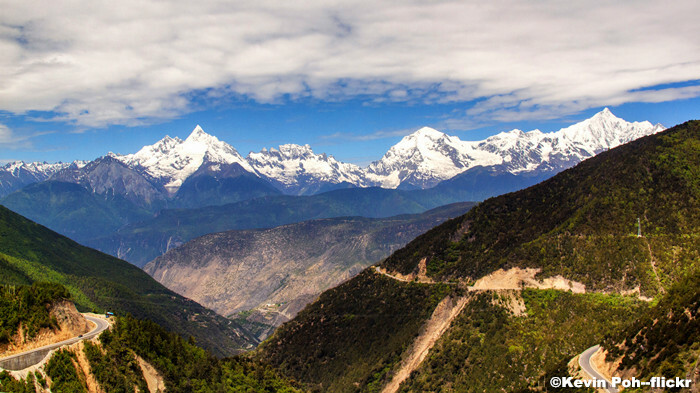 Meili Snow Mountain, also known as a God mountain, is located on the border of Yunnan Province and Tibet. Its location is very special for there are 3 main rivers flow through: Jinsha River, Mekong River and Salwen River. Up till now, no one has ever climbed to the top of Meili Snow Mountain and it is nicknamed as “a virgin peak”, leaving great mystery to lots of mountain explorers. With an average height of about 6000 meters, the mountain has a total of 13 peaks. There is no doubt that Kang karpo is the highest and most spectacular one, boasting 6740 merers above sea level. Early winter is the golden time to visit Meili Snow Mountain, because the weather becomes cozy and the snow-capped scenery turns attractive.